A librarian in segregation-era Alabama purchases a new children's book, The Rabbits' Wedding, for the library. But the nature of the seemingly innocent wedding draws the attention of a grandstanding, intolerant state senator, who leads a crusade against it. When the librarian stands her ground, the attention of the country focuses on the unexpected battle. 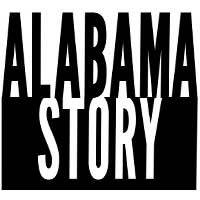 Based on a true story from the '50s, this production of Alabama Story at Undercroft Theatre is an area premiere. The Washington Stage Guild, a fixture on the DC theatre scene since 1986, offers Alabama Story as part of its 1st Amendment Project. "...Washington Stage Guild's production of Alabama Story is a timely story as it hints at issues of race and censorship, but it is slow moving and doesn't explore the issues presented as deeply as it could have." "...Director Kasi Campbell’s Alabama Story is a captivating and thought-provoking production. Enjoy!" "...In the opening scene, a shawl drapes the bench where Joshua and Lily talk. In the next scene the shawl has been removed and the "Whites Only" sign of blatant racism reads bright and clear. That simple sign in Alabama Story keeps the menacing tone from yesteryear front and center for the rest of the play. The subliminal story for today is that covering a sign doesn't make it go away. Feelings of superiority, entitlement, separateness and extreme cultural identity are still lurking under the surface of our social fabric. And it takes everyday people going about their business to make the tough decisions and take the actions necessary to change the story."